To celebrate International Women’s Day, we are profiling the brilliant female leaders at Anicca. 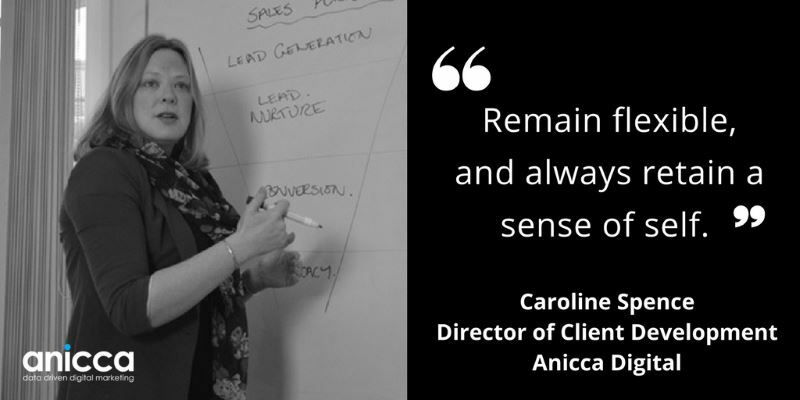 We talked to Director of Client Development, Caroline Spence about how roles change quickly in the dynamic world of marketing, and the importance of a life-work balance. How did you get into marketing and PR? I was originally a broadcast journalist working in local television, then I made my first leap into PR. My experience of knowing what journalists were looking for and my regional knowledge got me my first job in public relations. From there I progressed from issues-based PR (mainly in regeneration and housing) into consumer PR, looking after household name brands such as Wilkinson Sword and Bosch. Working alongside a client to produce a really exciting marketing campaign and achieving something special, which gives you a great sense of pride in your team. The launch of the Highcross shopping centre in Leicester ten years ago. It was by no means the largest campaign I’ve worked on, but it was special because it was a huge development in my home town. What advice would you give to people beginning their career? Remain flexible, and always retain a sense of self. Job roles will flex massively in the future and remain open to new opportunities and developing new skills will be key. Also, I think younger generations are better at this, company culture is really important, as is work-life balance. Your career is important but it shouldn’t be the only element in your life, and ensure that your personal priorities match with that of your employer.